Learn the Gyokko Ryu Wazas Step-by-Step! Learn the Kanji Strokes for all the Gyokko Ryu waza. The Gyokko Ryu school is at the core of the study of the Bujinkan teachings as it builds much of the foundations to the art. At IBDA we study this school in-depth along with the hanbo of Kukishinden Ryu for 2nd degree Black Belt. 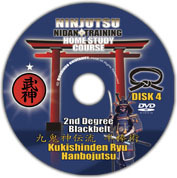 We also encourage the study of the Budo Taijutsu Course jsut after the completion of the Ninjutsu Shodan Course material. 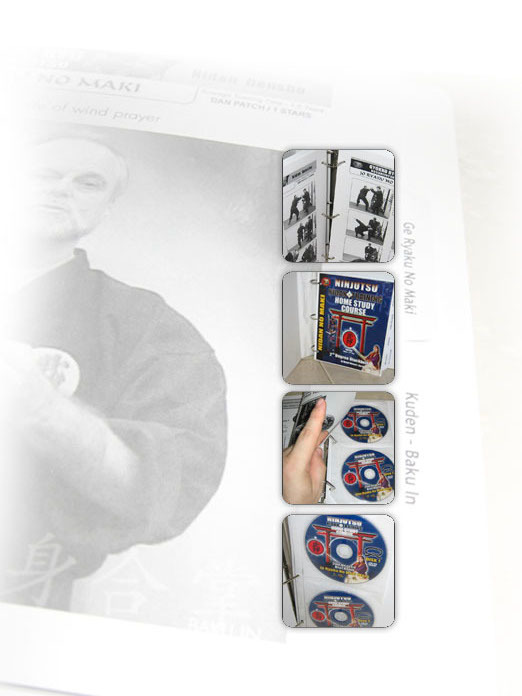 Training Course Manual 263 pages with waza photo instruction that matches matching the dvd training, plus how to write the kanji strokes for each Gyokko Ryu waza name! What's Inside the Nidan Course Binder Package? Nidan IBDA Training Course Manual - 263 Pages!! There is not another more complete Nidan or Gyokko Ryu Study Manual on the planet. Never has there ever been such a complete presentation in the history of this several hundred year old school. This is a living version of the actual Jewel Tiger School densho. Again, realize that in no time in history could you ever have access to so much of one school, especially at such a low investment to learn the material. This is your opportunity- one that those that started in this art before never had. The Manual contains History, Aspects of the art, Kamae, Moto Gata / Kihon Happo, Kosshi Sanpo, Sanshin No Kata, Baku-In, How to write the kanji strokes for the waza names, All the Gyokko ryu wazas in how to pictures taken directly from the dvd video lessons of the Jo Ryaku no maki, Chu Ryaku no maki, Ge Ryaku no maki and the Kukishinden Ryu HanboJutsu Shoden / Chuden / Okuden levels. All the above is packaged into a beautiful Binder Course. 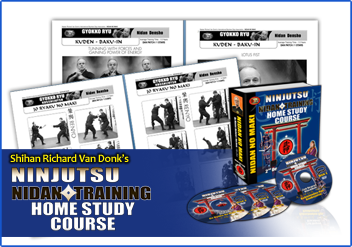 Great course-highly recommended-excellent training-thank you Master Von Donk!